How fabulous is quinoa? Its versatility, nutrient profile and deliciousness have made it almost a household name, and I see it appearing more and more in cafes, restaurants and several print publications. Just in case you may have missed the news, here is a recap. It has an amazing nutrient profile; high in protein, B vitamins (in particular B1, B2, B6 and folate), iron, potassium, zinc, calcium, magnesium and vitamin E.
It’s gluten free and lovely and easy to digest. It is quick and easy to prepare. It comes in red, black and white varieties to add colour and excitement to your meals! It’s slightly nutty, slightly chewy, slightly fluffy and completely delicious! It is a wonderful first food for babies mixed with vegetable or fruit purees. Note: pre-soaking the quinoa in water with a teaspoon of lemon juice for at least 6 hours will optimise digestion. Blend after cooking for young babies. Cooking quinoa is similar to cooking rice. I prefer the absorption method. Combine 1/3 cup of uncooked quinoa with 2/3 cup of water (or stock), bring to the boil. Cover, reduce heat to a simmer and cook for around 15 minutes. It will be translucent and plump when cooked. This will give you about a cup of cooked quinoa. Go forth and add to soups, salads, breakfasts, desserts, and as a replacement to rice or combined with rice for added nutritional benefit. There are literally thousands of ways to use quinoa! Here is another fabulous idea – double broccoli quinoa from Heidi Swanson. So, back to the tabbouleh. Traditionally made with bulgur, I substituted quinoa and added fresh parsley, mint, basil, toasted pumpkin seeds and a few cherry tomatoes (I really wanted to use pomegranate seeds instead of cherry tomatoes as I’m not crazy about tomatoes, but unfortunately the season in Australia is only just starting so I will have to be patient…..). Next is the dressing. You could keep it very simple and use a mixture of olive oil, lemon juice, salt and maybe some garlic. I love a particular dressing that Jude Blereau does in Coming Home to Eat with a roasted vegetable and quinoa salad, so I adapted it to my tabbouleh! Dish-licious! I had never seen a quinoa flower befor…cool. And what’s with not being crazy about tomatoes??! They are lip smacking good, and I miss them so much. Yummy! 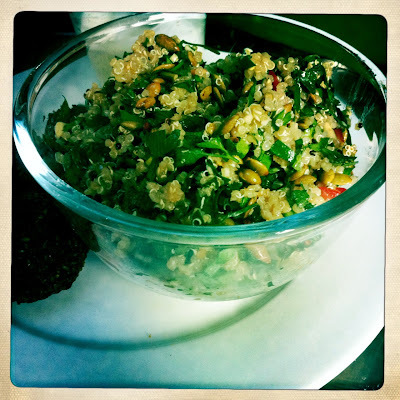 What a great idea, so glad I came across your blog – I love tabbouleh but it always leaves me bloated from the wheat. Will be trying this tonight. Thanks Meg! Keen Wah Rocks! Go Meg…keep up the great posts! Quinoa has changed my life! I love it! Thanks for introducing me to my new found love Meggy! You rock! Pingback: Chamomile Infused Spiced Quinoa – a hug for your tummy.